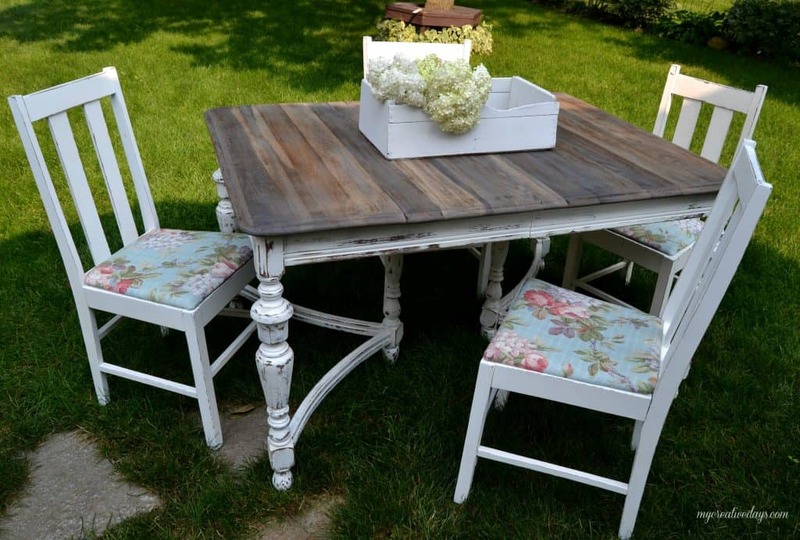 This farmhouse table and chairs was made from a curbside find! 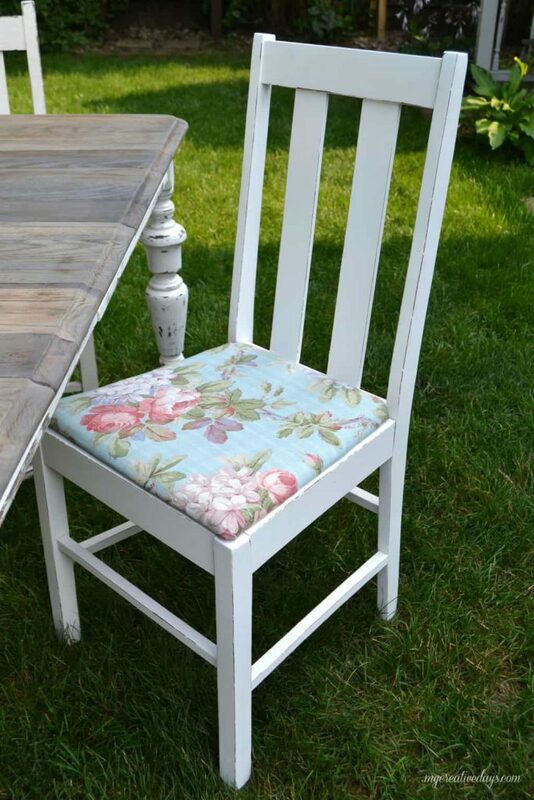 If you follow me on Instagram, you saw a glimpse of this Farmhouse Table And Chairs makeover the other day. Taking pics for the blog today. Gray weathered wood and chippy goodness all in one!!! This project has to be one of my favorite curbside rescues and makeovers yet. I am always a happy girl when I can rescue something from the curb and make it pretty again. Everything about this makeover was so exciting; from seeing it on the side of the curb with “free”signs all over it to the final product. This is what I spotted on the curb. Is it sturdy and functional? I can’t get to it fast enough to answer my questions. This time, as I got closer and saw what it was, my van couldn’t stop fast enough. It was all sturdy and still functional. There were a few things “wrong” with it. (More about that later in the post). YES! YES! YES! I can do something with this furniture! If I would have been there ten minutes ago, there were three more chairs. Someone had just come by and grabbed three of the chairs. He wanted the set out of his basement and I was happy to take it off his hands. There were a few “issues” with the table, but nothing that scared me away. The chairs were all in good condition, but didn’t match. I didn’t mind the vintage fabric that was on two of the chairs, but it was too worn. I knew exactly what I wanted to do with the table as soon as I got it home. All other projects were put on hold so I could tackle this set. To start, I sanded the top down to the bare wood. I left the legs as they were and just washed them. 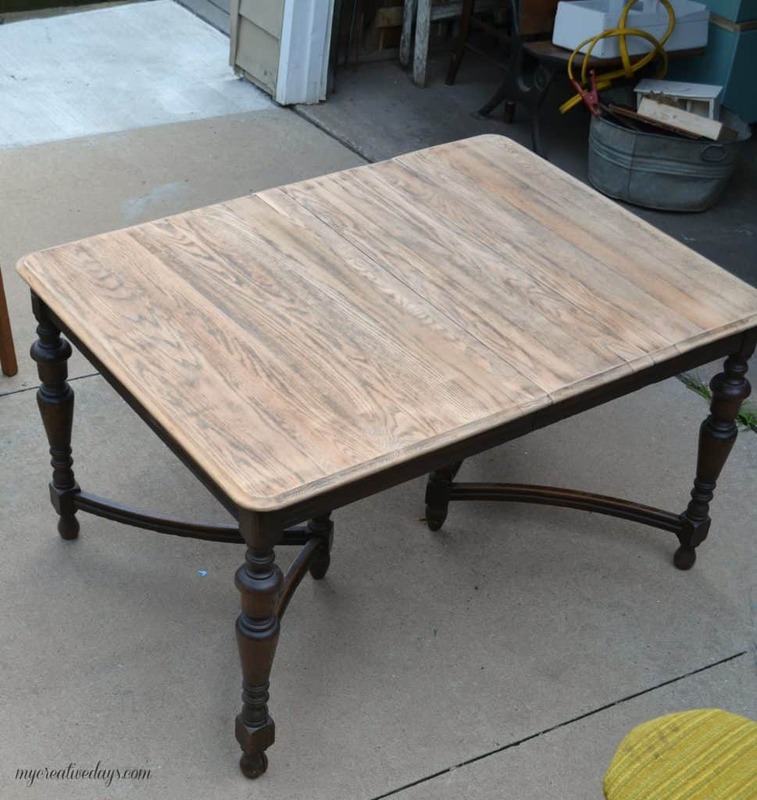 I used Weatherwood Stain (Reclamation) on the top of the table. As I was applying it to the table, it looked clear. I didn’t think it was going to work. 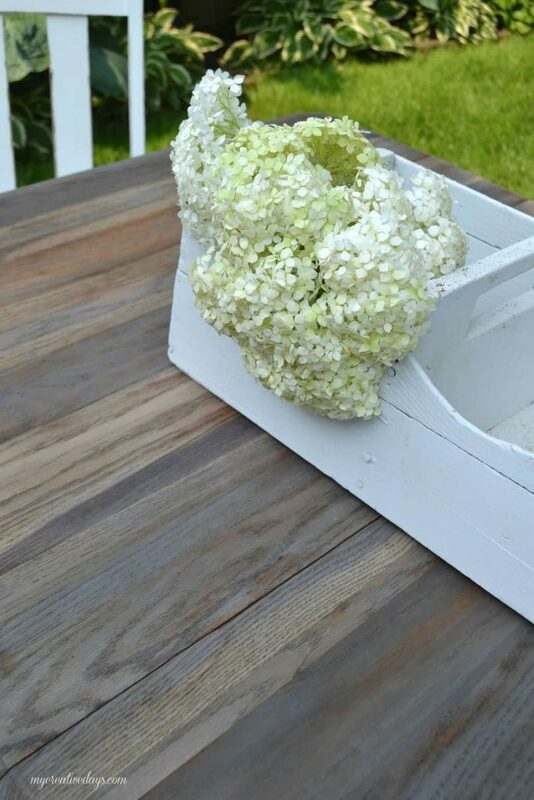 Then, after a minute or so went by, the top of the table was a beautiful, weathered gray color!!!! Now, I was really excited! This table was going to be a beautiful farm table. 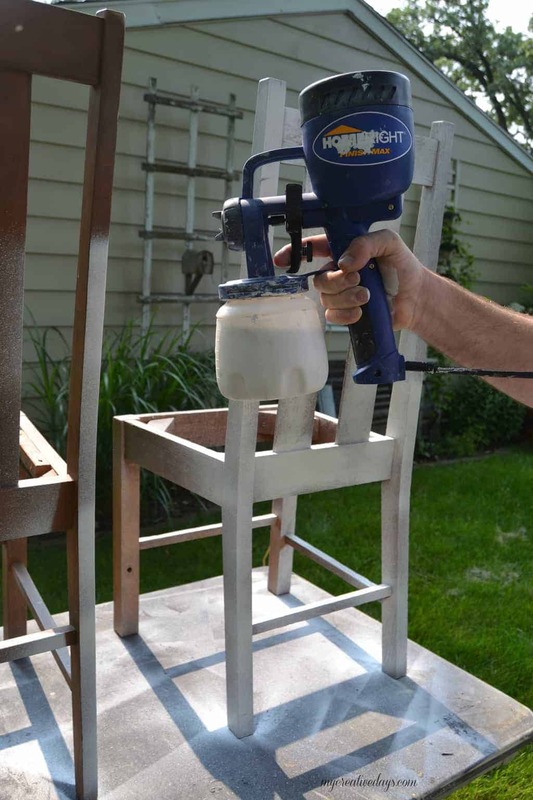 To unify the chairs, I brought out my trusted Finish Max Sprayer from HomeRight and painted them all white. Chairs are not my favorite thing to paint, but this sprayer makes them so easy to do and it is much quicker than using a brush or roller. 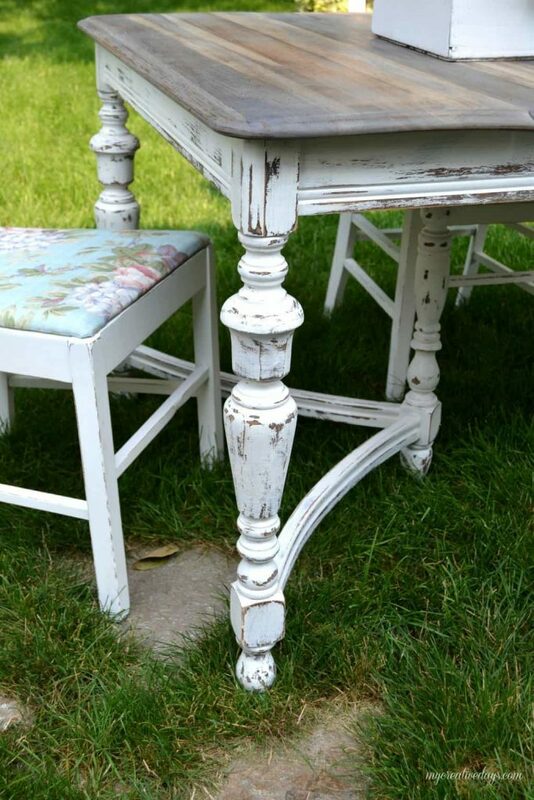 For the legs on the table, I painted them white and distressed them with a sander. 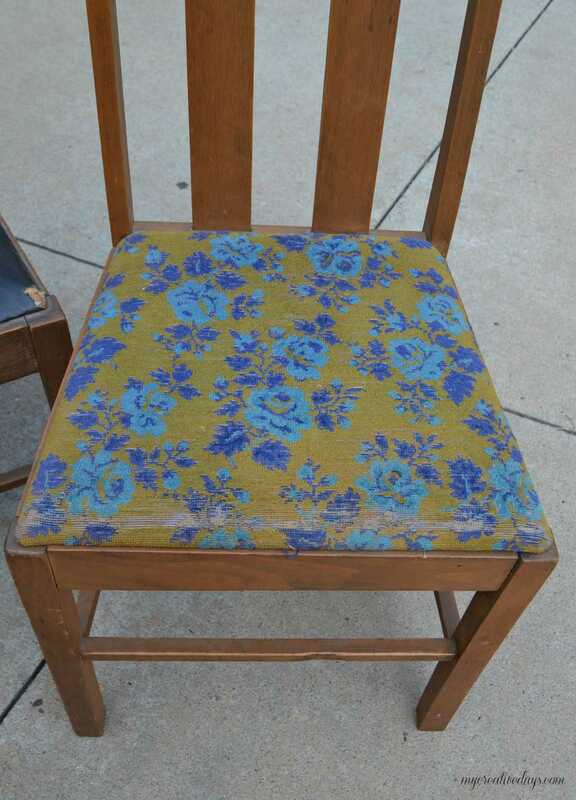 I recovered all of the chairs with fabric I had let over from a pair of chairs I did. Since there were only three chairs with the table, I painted a wood chair I had in the garage white to go with the set. It didn’t have a fabric seat, but was close to the same style so it worked. Look at this curbside set now!!!!!!!!!! 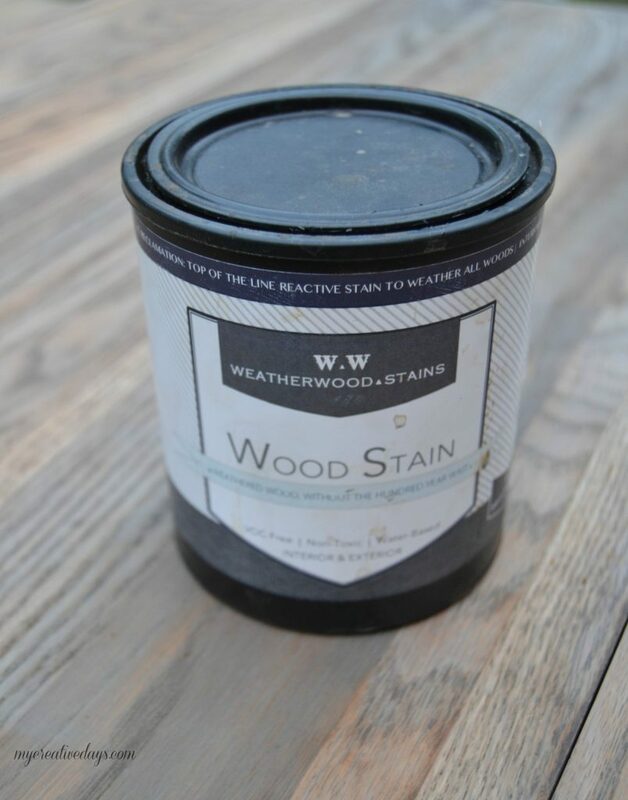 The Weatherwood Stain looks so good on the top. It is “weathered” to perfection. I will be using this stain on many, many more projects. I distressed the chairs with the sander as well. The new fabric makes them lighter, brighter and so pretty! As I was taking pictures for this post, I started getting a pit in my stomach thinking about the end of summer, the end of all the flowers and the end to all the natural light I am taking for granted right now. It is so much fun taking pictures when everything looks so pretty and the days are longer and lighter. Here are a few more beauty shots of this cast-off table. 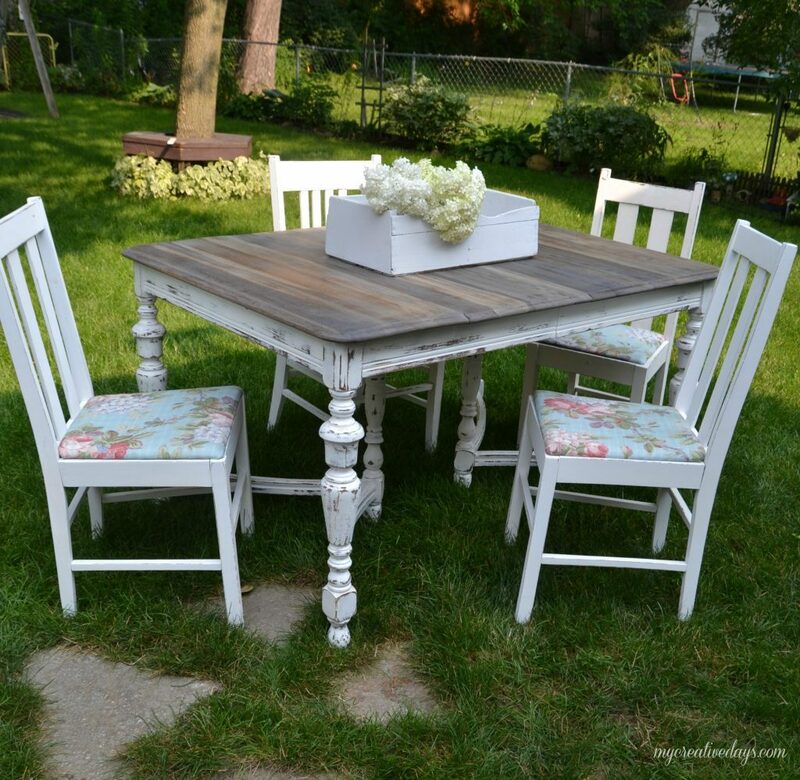 Who knew an old table and chairs on the side of the road could be such a beautiful farmhouse table and chairs. 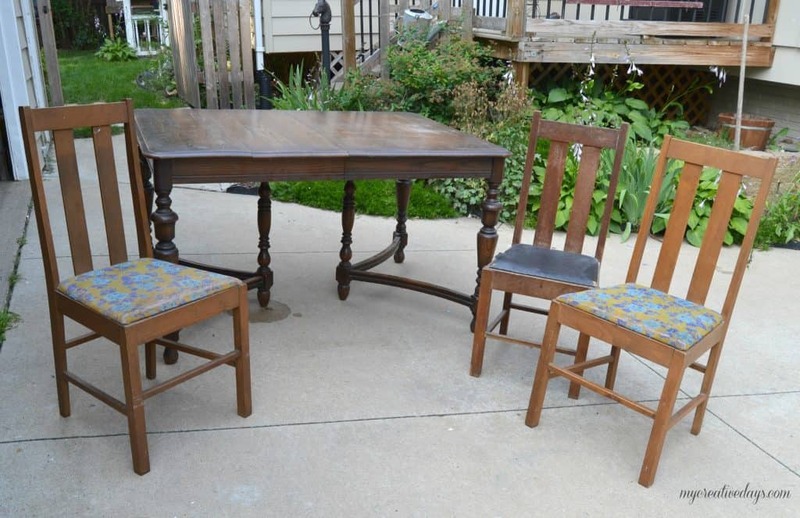 I was thinking about switching out our table and chairs for this set, but it sold faster than I had time to think about it. It went to someone who really needed a set and who loved the style. I couldn’t be more happy. I just wish I could find more amazing pieces to rescue from the side of the road. Thank you so much! 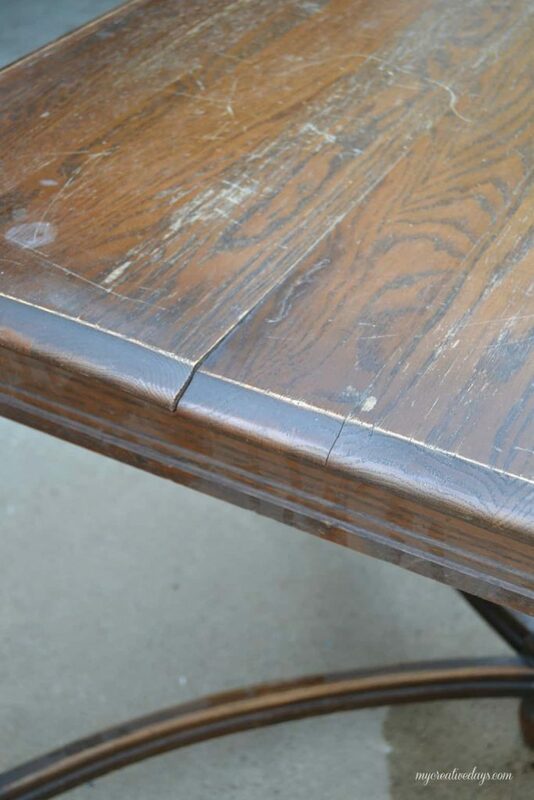 I love what the stain did to this table! Amazing! I love the stain. Where can I get it? Great job. I just loooovvveee curb side finds! Those were good questions to think about when a furniture was put on sale. It is nice you got it sold too, so the project is total success!! Rock on girl… but i find some brown on the table legs where white paint is done, it would have been lovely if you got all the table bottom in white so no patches are there, but ofcourse only my opinion your done a great job with so much enthusiasm, applause for that. Thanks for your comment Maria. I wanted the brown to show through. It is distressed and supposed to look that way. It was a huge success for sure. Saving something from the landfill and bringing it back to life – HUGE success! Simply amazing! I love the stain you picked out. I’m thinking about getting a paint sprayer…is it worth it? Thank you. Yes, it is worth it!! 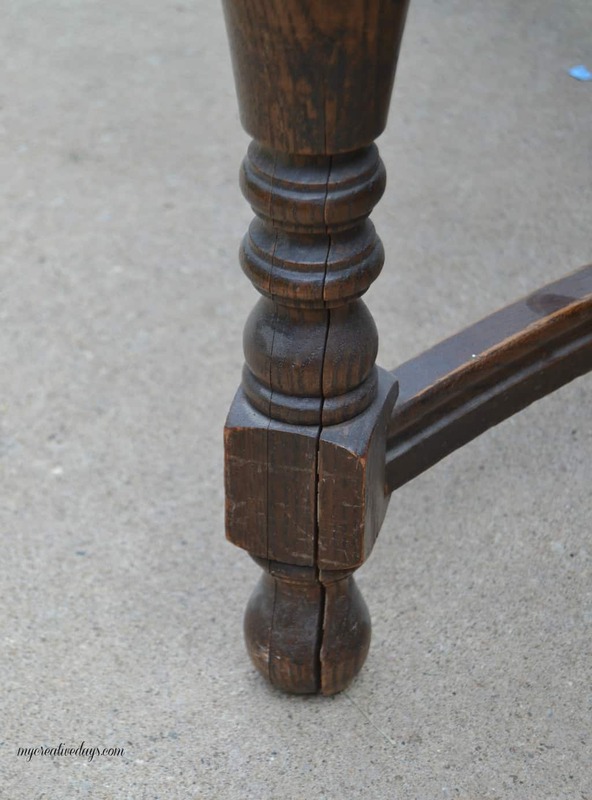 I love it for chair legs and table legs and so many other projects. Gorgeous! I get the same feeling when I see roadside freebies! What luck you had that day. It was a very lucky find! Wish I could rescue more things from the curb. Doesn’t happen that often around here. Amazing! This turned out so pretty. It’s always a good day when you can rescue something like this, make it beautiful again, and send it on to a new home. I’m not surprised it sold so quickly! 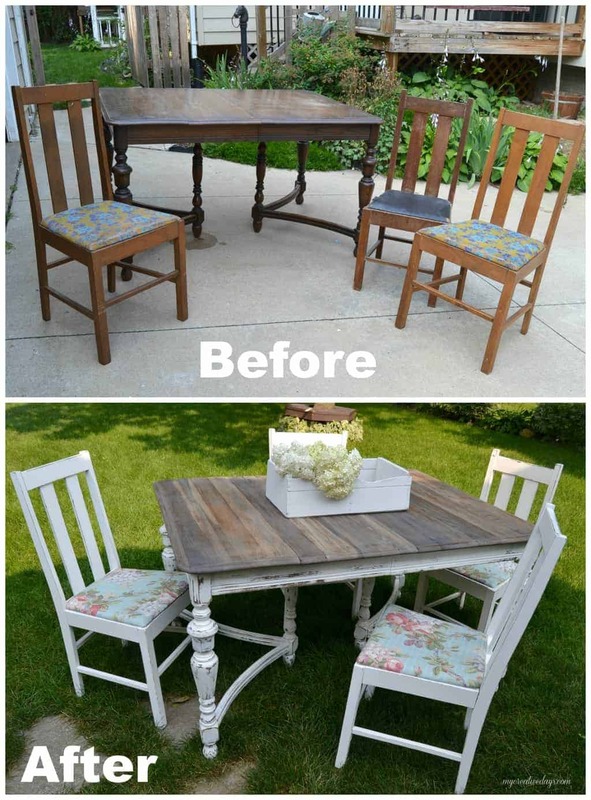 Great find and awesome makeover! I’m visiting you from Friday Finds Link Party. That is such a gorgeous transformation! I love the entire concept. It would look perfect in my kitchen. You did an amazing job and I love the stain! Thank you Lucy. I love the way the stain came out too! What a gorgeous transformation! Love the colors you used! Great find! Hi Lindsy, I came over from Lou Lou’s party, I had to see more of your project. It turned out great, I wouldn’t know where to start, I love that you kept the top and painted the legs, so country thats for sure. I liked to invite you to share your blog on my Wordless Wednesday in progress. HOpe you’ll join us! I did not put anything over the stain. That is not good if different products are changing the color? I wish I could tell you something to try?? I would take the can into your local home improvement store and see if the staff there can help you out. Good luck! First of all, I am so jealous that you found this on the side of the road! Second, I’m jealous of how beautiful it turned out. Thank you for inspiring me to continue to find and makeover things that others view as junk! That table was an amazing find on the side of the road. I was really lucky! Yes! Keep finding those pieces and breathing new life into them!!!! You did a great job! Looks amazing! What was the table sealed with? What protects it from food and water marks/stains? You kept such an authentic look!! I love how it turned out. I like to use a matte clear coat. Nothing glossy. Thanks for stopping by! Love the table. It appears that the top of the table is different colors??? Did you stain the top evenly? Or different colors? Or heavier in some places? Thanks for letting me know. And what did you seal it with? 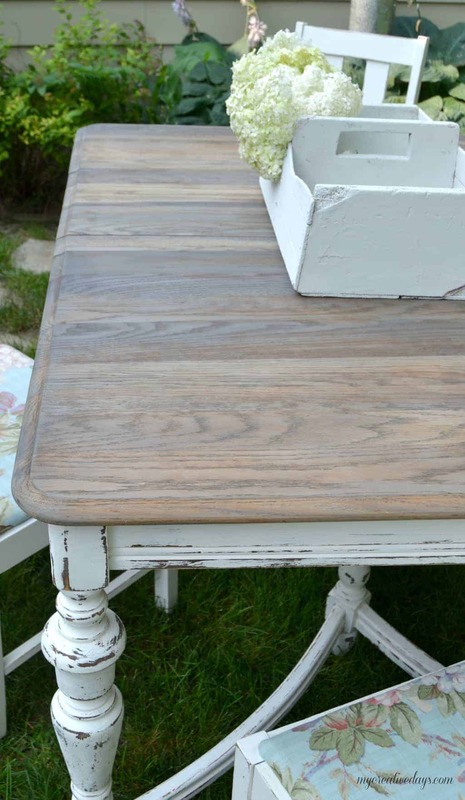 I have a dining room table that I am looking to redo and I love this look just need it to be super functional. Susan, I did not stain it at all. I just cleaned it and painted it and then distressed it. You can seal it with a matte finish top coat. I’m potentially going to attempt something similar with the top and legs being two different finishes, it’s great to see your steps. One question: after you stained the top did you cover it somehow in order to spray the legs? I’m a newbie, but confused how you didn’t accidentally spray the top too. I brushed the legs. I didn’t spray them so then you have more control over where the paint goes. Good luck on your makeover! 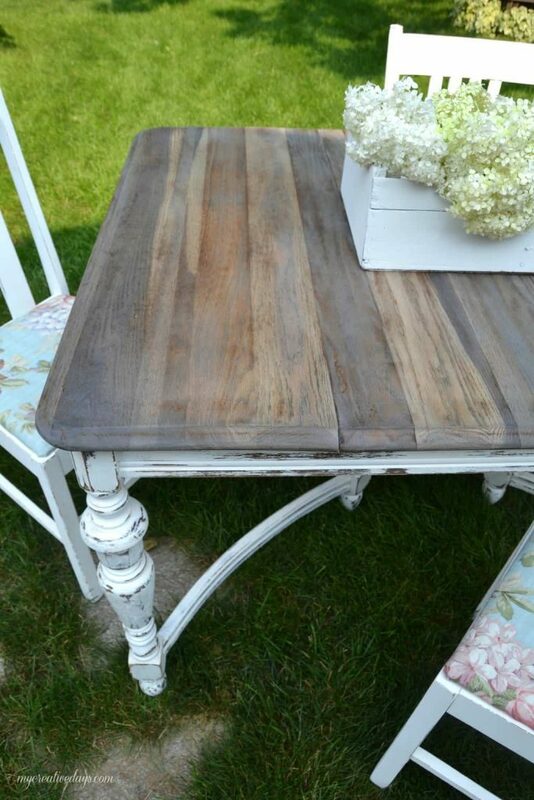 Wow, I love how you refinished the table, Lindsay! Yeah, I don’t think I would’ve wanted to know that tidbit of information either. Too bad because the makeover you gave the chairs, especially that pretty fabric, are stunning. Me and my wife became parents a couple of months ago, and we wanted to buy a Furniture then found your blog then able to know about this.